Printed in commemoration of author Jim Lynch and his June 2009 reading of Border Songs at Seattle’s Third Place Books. The design was created digitally and letterpress printed from photopolymer plates using a 1903 Colt’s Armory platen press. Printed in commemoration of artist Audrey Niffenegger’s October 2005 visit to Third Place Books, in celebration of the commercial printing of her artist’s book The Three Incestuous Sisters. The illustration and typography are Audrey’s, which I composed into this layout and letterpress printed from photopolymer plates on Magani Pescia paper using a Vandercook SP-15 press. The “red hair” is a piece of thread, which I sewed onto each of the 150 prints in the edition. 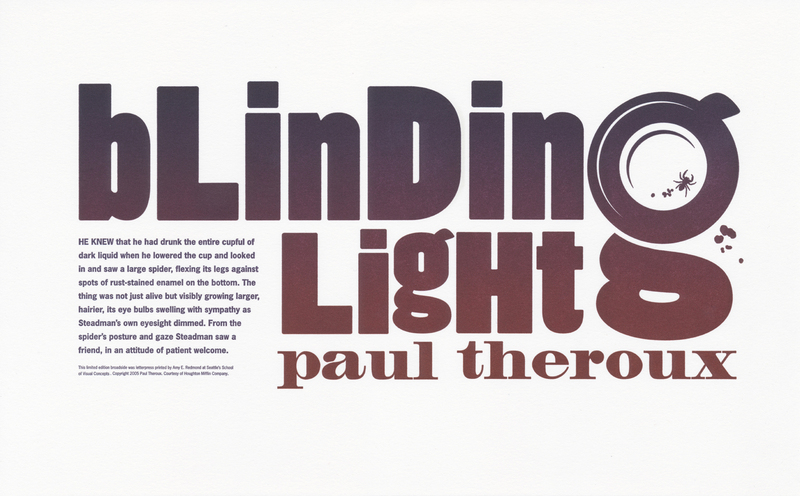 Printed in commemoration of author Paul Theroux’s 2005 reading of Blinding Light at Seattle’s Third Place Books. The design was created digitally and letterpress printed from photopolymer plates using a Vandercook 4 press. Printed in commemoration of Seattle author Stephanie Kallos and her December 2008 reading of Sing Them Home. 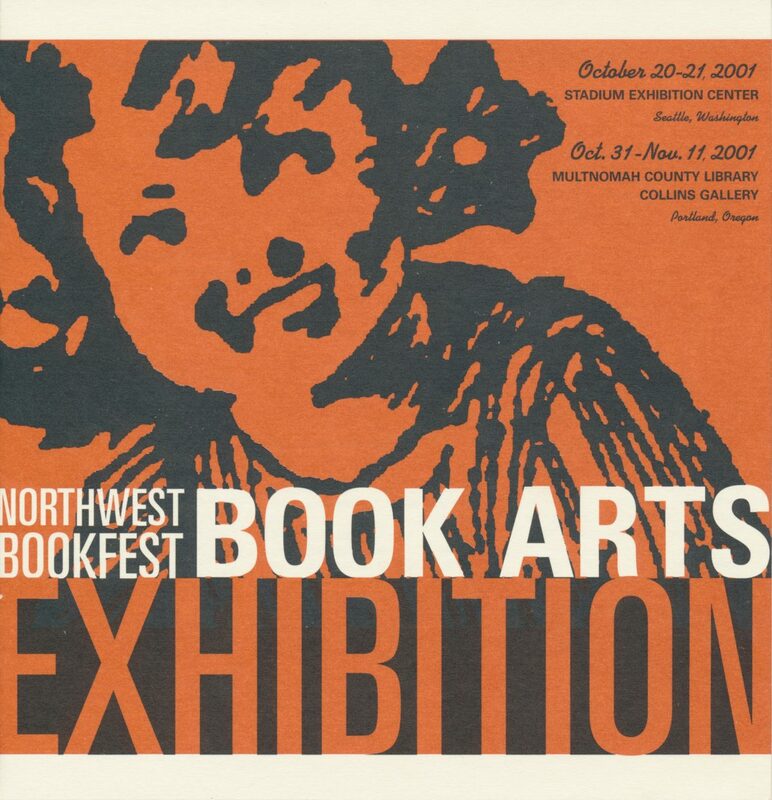 The design was created on the computer and printed from photopolymer plates on Daniel Smith Lenox paper using a Vandercook SP-15 press. Printed in commemoration of author Jonathan Evison’s 2005 reading of West of Here at Seattle’s Third Place Books. The design was created digitally and letterpress printed from photopolymer plates using a 1903 Colt’s Armory platen press. Printed in commemoration of author Jonathan Raban’s February 2007 reading of Surveillance. Inspired by letter forms and ornaments found in a letterpress shop, the design was created on the computer and letterpress printed from photopolymer plates on Daniel Smith Lenox paper using a Vandercook SP-15 press. 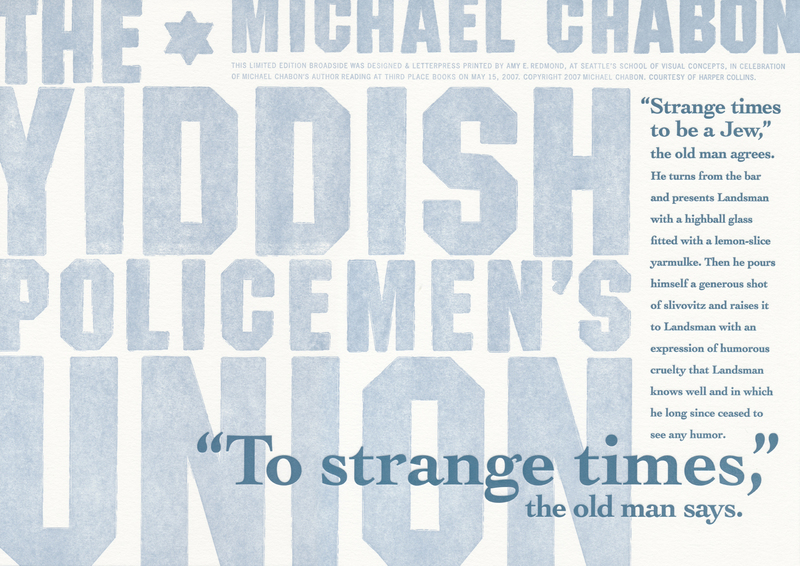 Printed in commemoration of author Michael Chabon’s May 2007 reading of The Yiddish Policeman’s Union at Seattle’s Third Place Books. 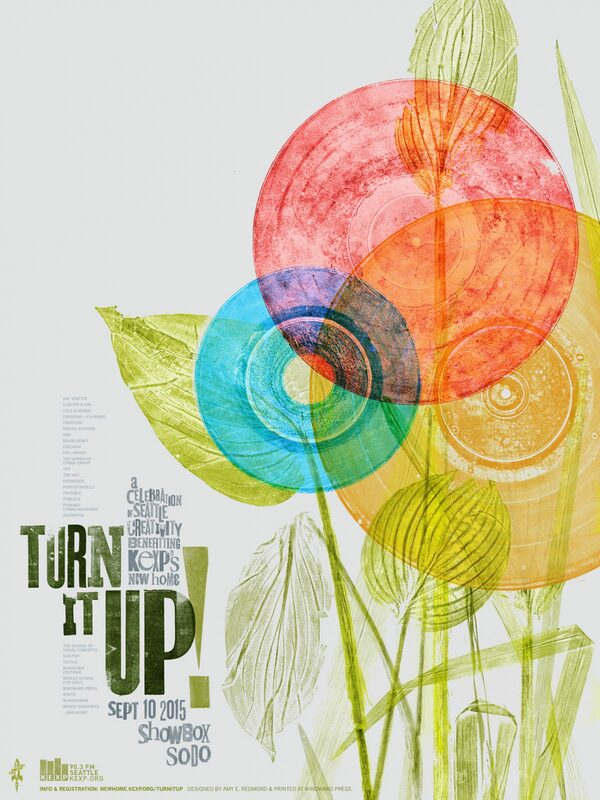 The design was created digitally and letterpress printed from photopolymer plates using a Vandercook SP-15 press. Printed in commemoration of author Leif Enger and his July 2008 reading of So Brave, Young, and Handsome at Seattle’s Third Place Books. 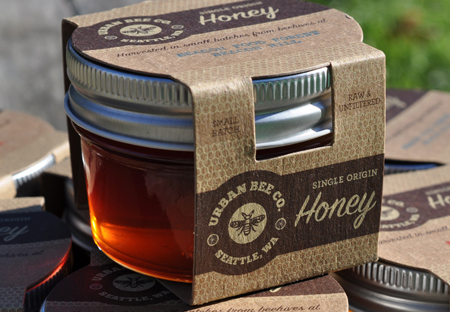 The design was created digitally and printed from photopolymer plates using a Vandercook SP-15 press. 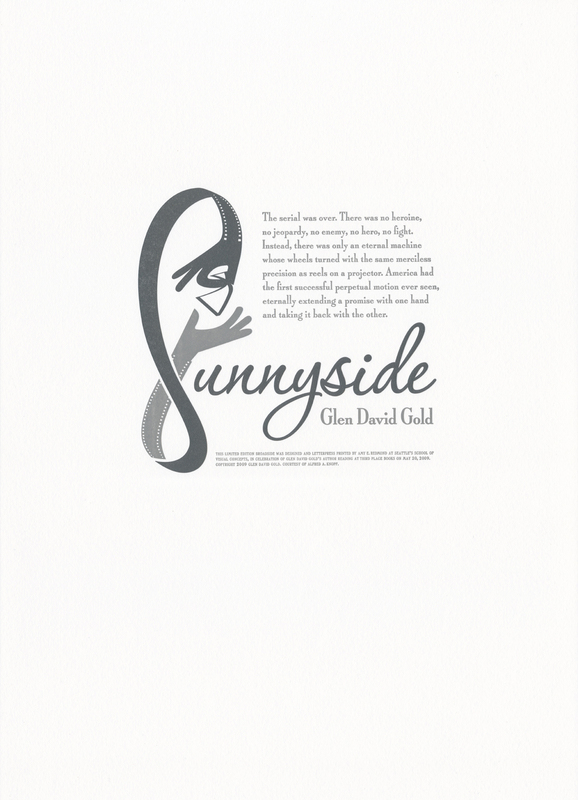 Printed in commemoration of author Glen David Gold and his May 2009 reading of Sunnyside at Seattle’s Third Place Books. The design was created digitally and letterpress printed from photopolymer plates using a 1903 Colt’s Armory platen press. Printed in commemoration of Portland, Oregon author/artist Joe Sacco for his September 2006 reading at Seattle’s Third Place Books. 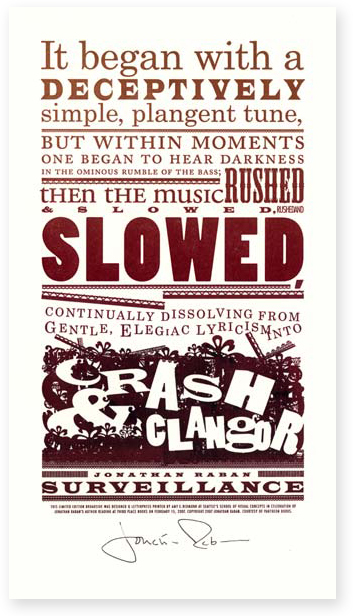 The illustration and typography are Joe Sacco’s, letterpress printed from photopolymer plates on chipboard using a Vandercook SP-15 press. Color was added by hand, using watercolor paints. Printed in commemoration of author David Mitchell’s April 2006 reading of his book Black Swan Green at Seattle’s Third Place Books. The wood type letter forms in the word “Mine” were scanned from hand-inked proofs I took of wood type in the School of Visual Concept’s letterpress shop, which were then combined with images and text composed digitally. The final print was printed on Magnani Pescia (an Italian cotton paper) from photopolymer plates using a Vandercook SP-15 press.